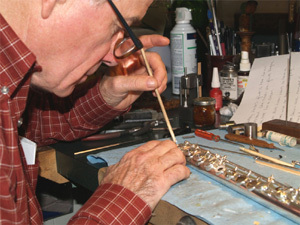 We repair flutes, piccolos, and clarinets by appointment. All repadding will be done with Straubinger Pads. Please also refer to our worldwide listing of over Straubinger Certified Pad technicians for flute. You can locate a technician in the United States or outside the United States. You may also locate a Straubinger Pads representative who does clarinet repair with our clarinet pads.